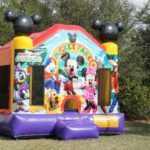 While the standard bounce house, also known as an inflatable castle or inflatable trampolines among other terms, is loads of fun, there are several ways to customize these portable attractions. One such option is an inflatable slide. Once filled with air, an inflatable slide becomes a second ride that can be as much fun as the bounce house itself. 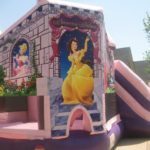 The ow to?is fairly simple; one just climbs the stairs of the bounce house and slides down the big inflated slide as many times as they please. Some safely precautions should be heeded. One should never slide down a bounce house slide head first or leap off it from the top. 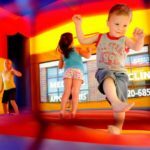 One should also be very careful when exiting the bounce house, as most of the injuries caused in bounce houses and other inflatable structures come when a user leaps out of the bounce house and on to the ground in a less than ideal way, causing a variety of impact related injuries. 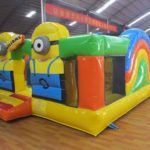 The bounce house and its slide will be made of either very strong vinyl and nylon or very strong PVC, and kept inflated with an electric or petrol powered blower. It is important to get a good, durable bounce house that will last you a while, ideally at least five years. 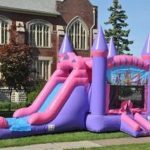 However, inflatable castles don’t last forever, so the owner should expect to replace it eventually. 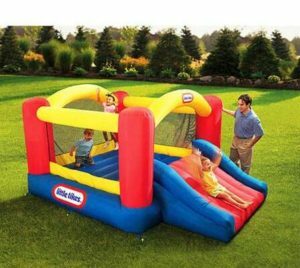 It is also advisable to get a bounce house that will allow for a number of people, at minimum five to six children. 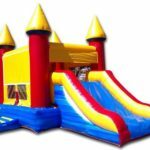 Filling it with water is not advisable, as the small holes that allow air to escape from the inflatable castle while it’s being constantly pumped with air will fill with water that has no easy way to get out and could lead to mold damage later on. When uninflated, some bounce houses can be large, unwieldy and heavy, requiring multiple people to lift it. 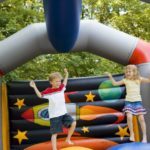 While this may not be a concern for smaller bounce houses, larger ones may be more difficult to move around. 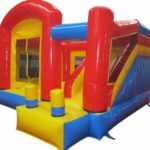 While bounce houses with slides may have more complications than initially expected, they are a lot of fun for children and adults alike. The slides in particular allow for a heart racing ride downward into a bouncy bed of air beneath. It’s not hard to have fun in a bounce house with a slide, no matter what your age!